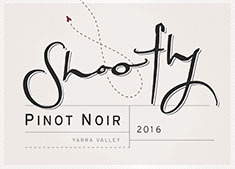 When it comes to Pinot, Shoofly is convinced that some of the best are found with their neighbors in Victoria’s Yarra and King Valleys. There, the cooler climate provides the perfect conditions for this sometimes fickle variety. The 2016 Pinot Noir has aromas and flavors that mirror one another with light cherry, spicy floral notes and a touch of mint underlined by an earthy complexity. A silky texture envelops the palate while the balanced flavors welcomingly linger on the finish.